Gavin Hyman is a specialist in continental philosophy and religious thought, and has written widely in this area. His publications include The Predicament of Postmodern Theology (2001), New Directions in Philosophical Theology (ed., 2004), A Short History of Atheism (2010) and Traversing the Middle: Ethics, Poiltics, Religion (2013). He has been Deputy Head of Department, and has served on the departmental Management Committee. 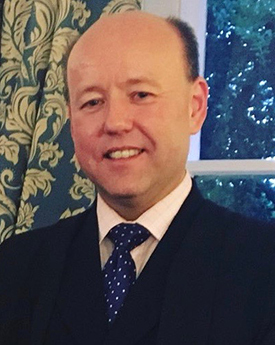 Beyond the department, he is the University Public Orator, and has actively supported the university's college system, having served as Vice-Principal of The County College and Senior Tutor of Cartmel College. He has also been a Visiting Fellow of Mansfield College, Oxford, and of Hatfield College, Durham. He was born in 1974, and was educated at the University of Exeter and at Peterhouse, Cambridge. He has taught at Lancaster since 1999. Gavin Hyman's research explores the implications of contemporary continental philosophy and cultural theory for religious thought, and, conversely, explores the ways in which theology both contributes to and calls into question contemporary philosophical and cultural assumptions.His first book, The Predicament of Postmodern Theology (2001) explored the relationship between two antithetical forms of postmodern theology: 'radical orthodoxy' and 'nihilist textualism'. It also raised the scaffolding for a form of religious reflection which avoids both the absolutism of radical orthodoxy on the one hand and the relativism of nihilist textualism on the other. Subsequently, he extended these explorations into the ethical and political arenas, resulting in a book entitled Traversing the Middle: Ethics, Politics, Religion (2013). It engages with the work of those who have called for the “return of the metanarrative” or insisted on the necessity of the domain of the “universal” on specifically ethical and political grounds. Negotiating between post-secular "univeralism" and postmodern "particularism", the book argues that the ethical and political are best preserved and perpetuated through the negotiating of an ongoing tension between the domains of the universal, the particular and the singular. To proceed thus would be to traverse the terrain of the middle—ethically, politically and religiously. He has also developed research interests in the cultural and philosophical history of atheism and secularism. In particular, he is interested in the epistemological shifts that created the conditions for the emergence of atheism and secularism in the early modern period. He is also interested in exposing the hidden philosophical (and often religious) presuppositions underlying contemporary manifestations of atheism. He has contributed to The Cambridge Companion to Atheism, has written A Short History of Atheism (2010) and has co-edited Confronting Secularism in Europe and India (2014). He is currently writing a book on the French thinker Michel de Certeau (1925-86), exploring the implications of his work for philosophy and religious thought. Continental philosophy and religious thought, especially debates in contemporary theology between 'radical orthodoxy' and 'secular theology'; the dialectical tradition in philosophy and theology (Hegel and post-Hegelian thinkers such as Gillian Rose, Charles Taylor, Rowan Williams and Slavoj Zizek); religion and psychoanalytic thought (especially in the work of Freud and Michel de Certeau); religion and political thought, particularly the origins and development of the Christian Socialist tradition; the philosophical and cultural history of atheism and secularism; contemporary debates on the nature of atheism and secularism. Gavin Hyman welcomes research proposals in the following areas, broadly conceived: Christian studies: theological, philosophical and historical approaches; Philosophy and religious thought; Postmodernism, theology and ethics; Continental philosophy; Religion and Psychoanalytic Thought. Hyman, G. 1/03/2019 In: The Wiley Blackwell Companion to Political Theology. Chichester : Wiley Blackwell p. 320-332. 13 p. ISBN: 9781119133711. Hyman, G. 2018 In: Misrecognitions. Eugene, Oregon : Cascade p. 126-142. 17 p. ISBN: 9781532613609. Electronic ISBN: 9781532613616. Hyman, G.L. 2018 In: The Palgrave Handbook of Radical Theology. Palgrave Macmillan p. 135-153. 19 p. ISBN: 9783319965949. Electronic ISBN: 9783319965956. Hyman, G.L. 2015 In: Vocabulary for the study of religion. E. J. Brill 5 p.
Hyman, G. 10/2014 In: ID: International Dialogue, A Multidisciplinary Journal of World Affairs. 4, p. 4-15. 12 p.
Hyman, G. 2014 In: The future of continental philosophy of religion. Bloomington : Indiana University Press p. 154-166. 13 p. ISBN: 9780253013835. Electronic ISBN: 9780253013934. Black, B., Hyman, G., Smith, G.M. 2014 London : Bloomsbury. 224 p. ISBN: 9781780935065. Electronic ISBN: 9781780937311. Hyman, G. 2014 In: Syndicate. Eugene, OR : Cascade p. 71-78. 8 p. ISBN: 9781498208765. Hyman, G. 2014 In: Confronting secularism in Europe and India. London : Bloomsbury p. 61-75. 15 p. ISBN: 9781780935065. Electronic ISBN: 9781780937311. Hyman, G. 2013 Eugene, OR : Cascade. ISBN: 9781610974479. Hyman, G. 06/2012 In: Approaching Religion. 2, 1, p. 66-74. 9 p.
Hyman, G. 2011 In: Journal for Cultural and Religious Theory. 11, 2, p. 240-254. 15 p.
A Short History of Atheism. Hyman, G. 2010 London : I B Tauris. 240 p. ISBN: 9781848851375. Hyman, G. 2009 In: Encyclopedia of the Bible and its Reception. Berlin : Verlag Walter de Gruyter ISBN: 9783110199048 9783110183559 9783110183702. Hyman, G. 2009 In: Theology Today. 65, 4, p. 35-49. 15 p.
Hyman, G. 2008 In: Journal for Cultural and Religious Theory. n/a, 9.1, p. 35-49. 15 p.
Hyman, G. 2008 In: Diálogo interreligioso : el problema de su base común. Bogota´ : Editorial Universidad del Rosario p. 8-10. 3 p. ISBN: 9789588298948 9588298946. Religion and Psychoanalytic Thought: A Contemporary Re-Evaluation. Hyman, G. 2008 In: Theology. 111, p. 3-11. 9 p.
Hyman, G. 2007 In: Journal for Cultural and Religious Theory. 8, 3, p. 124-134. 11 p.
Hyman, G. 2006 In: The Cambridge companion to atheism. Cambridge : Cambridge University Press p. 27-46. 20 p. ISBN: 9780521842709 0521842700 9780521603676 0521603676. The Study of Religion and the Return of Theology. Hyman, G.L. 1/01/2004 In: Journal of the American Academy of Religion. 72, 1, p. 195-219. 25 p.
Disinterestedness: The Idol of Modernity. Hyman, G. 2004 In: New Directions in Philosophical Theology: Essays in Honour of Don Cupitt. Ashgate 200 p. ISBN: 0754650618. Hyman, G.(. 2004 Aldershot : Ashgate. 200 p. ISBN: 0754650618. Radical Orthodoxy, Ethics and Ambivalence. Postmodern theology : the apotheosis or scourge of Liberalism? Hyman, G. 2002 In: The future of liberal theology. Aldershot : Ashgate p. 191-207. 17 p. ISBN: 0754606864 9780754606864. Religious language in everyday speech : a response to Don Cupitt. Hyman, G.L. 01/2001 In: Modern Believing. 42, 1, p. 24-30. 7 p.
Hyman, G. 2001 In: The Blackwell companion to postmodern theology. Oxford : Blackwell p. 192-193. 2 p. ISBN: 0631212175 1405127198. Hyman, G.L. 2001 In: Blackwell companion to postmodern theology. Oxford : Blackwell p. 192-193. 2 p. ISBN: 0631212175 1405127198. Hyman, G.L. 2001 In: Concise encyclopedia of language and religion. Amsterdam : Pergamon/Elsevier p. 308-310. 3 p. ISBN: 0080431674. The Predicament of Postmodern Theology Radical Orthodoxy or Nihilist Textualism? Hyman, G.L. 2001 Louisville, Kentucky : Westminster John Knox Press. ISBN: 0-664-22366-4. Hyman, G. 2000 In: Metzler Lexikon christlicher Denker : 700 Autorinnen und Autoren von den Anfängen des Christentums bis zur Gegenwart. Stuttgart : Verlag J. B. Metzler p. 605-608. 4 p. ISBN: 3476017060 9783476017062. John Milbank and Nihilism : a metaphysical (mis)reading? Hyman, G.L. 2000 In: Literature and Theology. 14, 4, p. 430-443. 14 p.
D. Z. Phillips : the elusive philosopher. Hyman, G. 1999 In: Theology. 102, p. 271-278. 8 p.
Hick and Loughlin on Disputes and Frameworks. Hyman, G. 1998 In: New Blackfriars. 79, 931, p. 391-405. 15 p.
Towards a New Religious Dialogue: Buddhism and Postmodern Theology. Hyman, G.L. 1998 In: Heythrop Journal. 39, 4, p. 394-412. 19 p.